Stepping into Chiosco by Ormeggio, the more street style sister restaurant to the two hatted Ormeggio restaurant,felt like stepping onto a boat (minus the sickness inducing rocking!). The restaurant sits on the wharf in Mosman and is nestled amongst a number of docked boats. The small dining area gives the restaurant a more personal and welcoming feel and the friendly staff, many of whom boast a thick Italian accent, add to that feel. Despite the chilly winter outside, the restaurant is unusually warm so we all immediately take off all our winter layers before sitting. Our waiter patiently waits while we do, before telling us the specials of the day and leaving us with the menu. No need for that, after a week of very clean eating I had already downloaded the menu on my phone and planned my indulgent weekend meal. The menu isn't too elaborate, a range of entrées designed to share, a small number of pasta dishes, a larger selection of mains and then a few dessert and drink options. Having craved pasta all week I ordered the Gnocchi with basil pesto and ricotta salata ($20). I also ordered a watermelon virgin mojito ($9.50) just because it sounded delicious. The drinks arrived quickly, the mojito was a tasty and refreshing treat, that helped cool us down a little in the warm restaurant. Plus it wasn't very sweet, which meant it wouldn't alter the tastes of our mains. My gnocchi arrived not too long after our drinks, and smelled delicious. Being used to gnocchi served with a tomato based sauce the pesto flavours were a nice change. The sauce was nice and not too heavy and you could taste the fresh basil. The gnocchi was soft and fluffy and cooked perfectly. The portion, although may look small, was exactly right. Filled me up but left me with room for dessert, which I was eagerly anticipating. 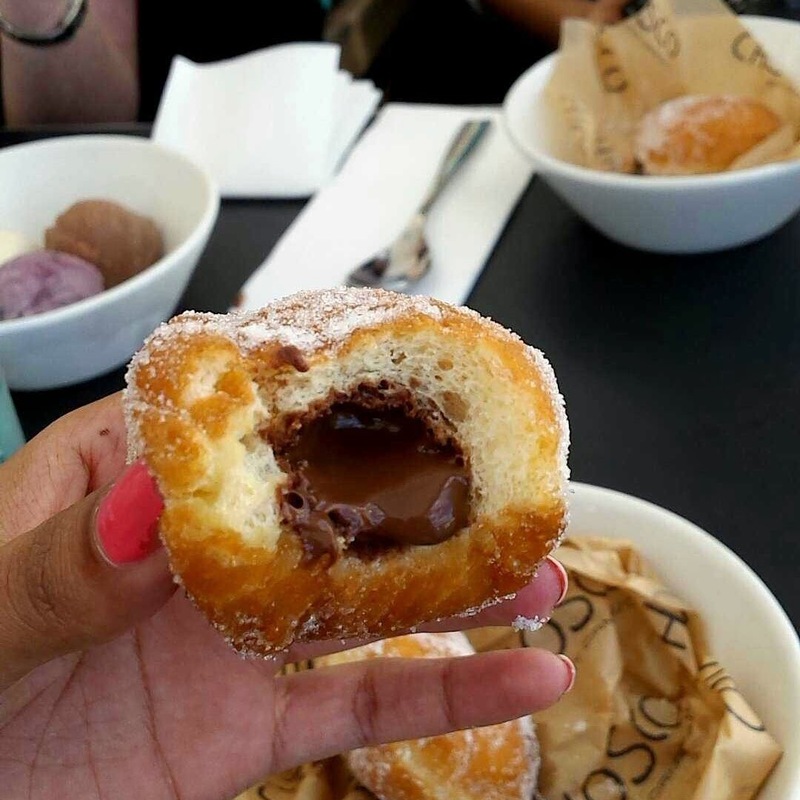 For dessert I ordered the bombolone filled with nutella ($10). I was expected just one large one to arrive but my greedy self was pleased when three were served to me. After taking my first bite into it, the warm nutella began to ooze out and I realised there was no way to eat these neatly so I may as well enjoy the mess. I felt like a child, my fingers and mouth covered in chocolate and sugar but it was definitely a happy child. The pastry was light and the nutella with it was heaven. We ordered two sets of these to share between three, meaning two each but I struggled to finish my second one (as much as I tried) so I would definitely recommend ordering this to share unless you have a big appetite. With full and happy stomachs, we decided to burn off some of the calories by walking on the wharfs and admiring the fancy boats and funny names (Nautorious was one of our favourites). If you are in the area, I would definitely recommend Chiosco by Ormeggio for a nice and relaxing lunch with a touch of fancy. The food was good, and reasonably priced considering its relationship to a hatted restaurant. That gnocchi and pesto sauce look so good!! I love gnocchi, looks delicious!